Rachel Smith co-founded the law firm in 2005. She founded the firm to help people who have been injured through the fault of another. She primarily handles nursing home cases, wrongful death, car wrecks, motorcycle wrecks, truck wrecks, boat wrecks, ATV accidents, bike accidents, and premises liability (slip and fall) cases. 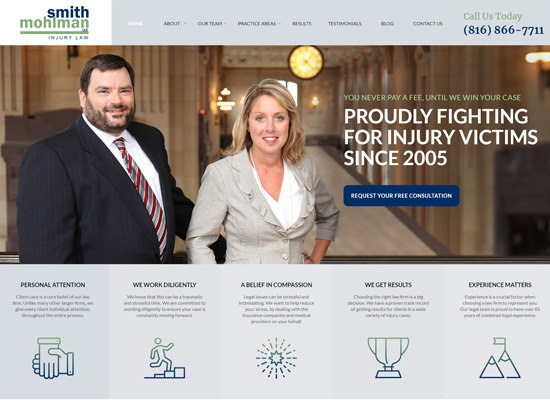 Her firm has obtained millions of dollars in recoveries for folks who have been injured. Rachel is also a certified mediator and is often asked to act as a neutral third party to try and resolve civil cases. Rachel is also a certified mediator and is often asked to act as a neutral third party to try and resolve civil cases. She is admitted to practice law in both Kansas and Missouri. In 2005, Rachel formed her own law firm in order to help and protect people and to improve community safety. Ms. Smith is very active in her community. She was an executive member of the Board of Big Brothers and Big Sisters of Kansas City for eight years and continues to volunteer time to the agency. Rachel currently sits on the board of Project Walk, an organization that provides therapy to quadriplegic patients. She also co-founded Smith Mohlman Foundation, a foundation that helps Kansas City community efforts. Rachel was selected as a Superlawyer Rising Star in 2009, 2010 and 2011. She was also selected as one of the “40 under 40” by the National Trial Lawyers, and was selected as a 2012 “Woman Who Means Business” by the Kansas City Business Journal in 2012.